I’m excited to introduce this week’s guest blogger, Paul, who is from Toronto, Canada. He took a detour from his original path of pursuing law by going halfway around the world to teach ESL in Korea. 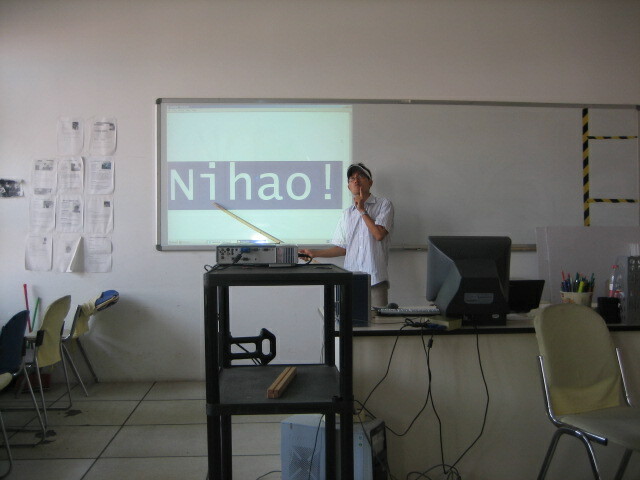 After realizing his passion for teaching, he pursued a degree in teaching and is currently teaching high school computer science at an international school in Dailian, China. It’s always refreshing to meet other educators who love what they do! I wanted to take this opportunity to share a revelation I had in a ginseng tea shop at Incheon airport in Korea 5 weeks ago. I was sitting there with my own cup of tea, passing the time on my laptop, when I observed a couple ordering some tea at the counter. Immediately, two things were apparent. The first was that they were newly-wed and the second was that they were on a backpacking trip. Accordingly, two thoughts ran through my head: the first was ‘it must be nice to be newly-wed’ and second, ‘I wonder how they enjoyed Korea?’ The latter thought made me reflect on my own time in Korea, and that’s when I had my ‘Eureka!’ moment. I realized that the Korea I knew and had experienced for 4 years was nothing like the Korea this couple had experienced in quite possibly a few days. As common-sense as it may be, I realized that the more time spent in a place, the more intimately one would come to know a place, and this got me to thinking about the breadth and depth of knowing things. We all have a finite amount of time and energy. How we invest this time and energy results in increasing either our breadth or depth in knowing a thing. For example, when we travel, the reason we visit different countries, even if it be for a couple of days, is to experience and see new things. In this case, we are expanding our breadth of knowledge. If we spend more than a year in the same place, we begin to drift away from breadth and begin to move towards depth. Things are no longer new, and through repetition, we begin to delve deeper into becoming familiar with a thing. To take an example, when I lived in Korea, I really went out of my way to try different foods. Whenever I tried a new food, I would be expanding my breadth of knowledge in knowing Korean food. However, it’s not everyday that I would be able to try a new food. Rather, more often than not, because I would be working at school, I would usually eat common foods such as rice, kimchi, and doen-jang jjigae (bean-paste soup). Through the repetition of eating the same food everyday, a depth or familiarity developed with that very food. And do you know what happened to me last month when I visited Korea? I was sitting in a traditional Korean restaurant in Kang-won province, with a bowl of rice, a side-dish of kimchi, and a bowl of doen-jang jjigae in front of me. I went to taste the doen-jang jjigae, and I kid you not, my eyes began to tear. It wasn’t just the taste, which in itself was exquisite (being in the country-side, it was as authentic as it gets), but it was also the depth surrounding the experience. In that first taste, recalling the four years I spent in Korea, eating doen-jang jjigae day in and day out, I said to myself, “dang, that’s some good doen-jang jjigae.” And the point here is that I knew it only the way someone who had lived in Korea for 4 years could know it. You might be thinking to yourself, “So what? I’m glad you have a special relationship with doen-jang jjigae. In fact, I think you and doen-jang jjigae should get a room…” Okay, well…no need to be facetious. I’m just trying to illustrate what I mean by depth. One of the things that attracts me to international teaching is that it gives me a chance to develop this very depth that I’m talking about. Whether it be working abroad as an international teacher, or living abroad in some other capacity, isn’t it fair to say that living in a place for 6 months is different from 1 year, which is still different from 2 years, which is still different from 5, or even 10 years? I believe being a good international teacher is greatly helped if you have a love and passion for learning another place in depth, which includes embracing such things as different culture, language, and food. Don’t get me wrong, there are a lot of international teachers out there who have no interest in learning their new country of residence, yet still win my full approval for being a good international teacher. However, I would make the argument that performing to your best ability requires being comfortable. If we are comfortable, this means we are familiar, and if we are familiar, it means that at some point, an investment of time and energy has been made. This week’s guest blogger is not only a rare high school math and physics teacher, but also my younger brother. Even though teaching was not something he originally planned on doing, he is quite good at it. (It must have been due to all those times we played school together and I was of course the teacher and he was one of the students in my class.) I had the unique privilege of teaching at the same school as my brother in Korea and I could tell that he was making quite an impact on their lives. As a certified nerd and non-certified math teacher for the last 5 years, I’ve realized quite a few things about my “oh-so-lovely” students. The most important of these can be spelled out with a simple cliché: every single one of my students can change the world. I don’t mean this in a butterfly effect type of way where if they flap their barely post-pubescent wings now, it may cause a storm of ominous and unavoidable chain reactions leading to the complete, utter, and mass destruction of the world. But I mean this in a genuine way, where I’ve come to believe that I’m teaching the future leaders, policymakers, and trendsetters in a constantly changing and evolving world (that hopefully won’t end in mass destruction). My students are world changers. In my ‘selfless’ quest to prod my students along on this journey towards success and hopefully a share in their future billion-dollar corporations, I started off with some new classroom decorations. Realizing their need for good role models outside of their suicidal celebrities, largely absent fathers, and their overly sarcastic math teacher, I decided to post up pictures of my heroes in the math world for them. As I desperately tried to explain how Einstein, Gauss, and Euler are important to their future successes and why giving equity to past teachers is a good business decision, I didn’t get much of a response from my iphone-hugging, gangnam-styling students. A few blank stares, nervous nods, and a feigned laugh later, I realized I needed to change my approach. A bit discouraged, but still unfazed, I decided to turn the tables on my students. I gave them a simple homework assignment: Come to math class with 3 math quotes that are not from google (aka write them yourself!). The following class, we took time to share the quotes in class and we voted for which quote we liked the best for each student. 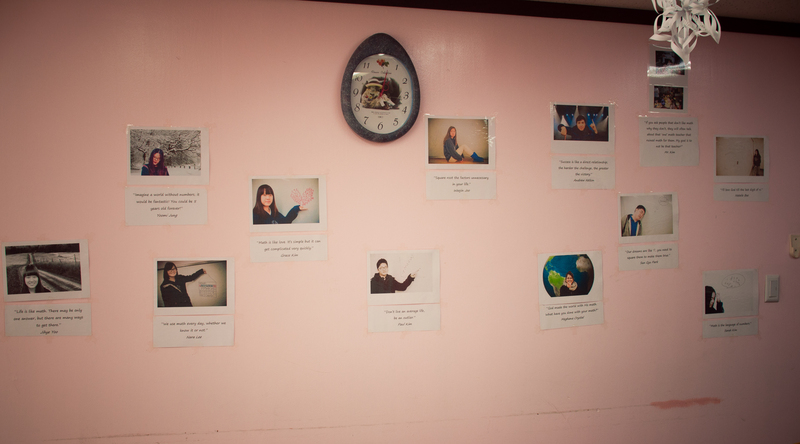 And then we went for an impromptu photo shoot in our classroom armed with my DSLR, the bulletin board, and a pinch of creativity (aka adobe photoshop). 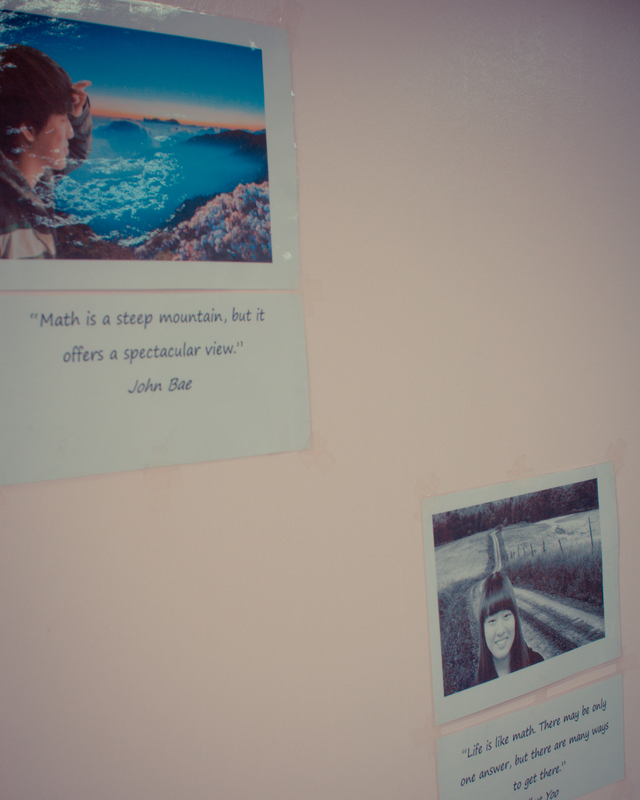 I printed out the pictures along with their quotes, laminated them, and posted them on my back wall. Now everyday when my students walk into the classroom or look to the back because they’re tired of looking at my handsome face, they see a wall full of world changers: Einstein, Gauss, and Euler, next to Bae, Kim, Lee, Nelson, Crystal, Jung, and probably some more Kims. This past July, one of my long time wishes finally came true. I finally got a sister! We welcomed into our family Jane, who married my brother, Brian. I’m thankful to finally have a younger sister who I can go shopping with and do “girly” things with. I’m also thankful that she’s a passionate educator making a difference in the lives of her students Korea. This is her first year teaching middle school and high school English at an international school in Seoul. When I take a step back and actually realize what I’m doing, I’m in utter… awe. As a high school English teacher, I often get comments like “Oh, you’re an English teacher? So you must really love books, huh. What’s your favorite?” It’s a fair question, but I still struggle to know how to respond. To be honest, it has been a while since I sat down to read a literature book for pleasure, and no, I don’t absolutely love reading and writing. And to be really honest, I’ve often struggled with reading and writing throughout high school and beyond. So, how and why am I teaching English to high school students? I’m often reminded of the answer when I get comments from my students about how much they hate writing essays and how hard it is to understand “Paradise Lost”. Strangely, these comments don’t frustrate me; they invigorate me. They remind me of how I used to be. I remember reading many books as a child because I liked fun, exciting and moving stories. I mean, who doesn’t? If I hadn’t been exposed to reading books, I think I would’ve gotten into movies, cartoons (now it’s anime), or even video games, like many of my students now seem to enjoy way more than books. I also wrote a lot of stories and poetry growing up, because after reading so much, my hand just naturally began to imitate what I read. My own creativity was fueled by the stories I was immersed in. And most of all, I know I wasn’t the only one. Look at the posts below! All of Jee Young and Melody’s students love to read! So why did so many of us stop enjoying reading and writing in high school? Something happened as we got older. No longer were we receiving praise for our writing, but we were seeing red marks all over the things we wrote. We received A’s and B’s on some papers, but we really can’t remember those. There had to have been things that we wrote well, but they were buried under the red scribble about missing commas, “awkward” sentences, question marks, “too long”, “too short”, wrong font, disorganized, lack of flow, and the list goes on. And as for reading, well, homework, Sparknotes and academies had taken over. No time for that. Of course, there are things that I, as a teacher, have a responsibility of teaching my students. Yes, proper grammar and writing style is pretty important. Yes, picking up on the author’s intent and techniques in a reading may also be important. But at the cost of what? When students walk into my classroom, they have either begun or are in the midst of another day as a teenager. I have 70 minutes with them before they move on with their day. There are a countless number of skills that they need to learn. But becoming more apt in reading and writing does not motivate my students. Some have decided that they’re already bad at it, and others have developed a formula for doing enough to get the grade. And 70 minutes is simply too long to teach irrelevant skills to unmotivated students. I’m learning that teaching English is much more about teaching than it is about English. In the midst of broken families and vicious teenage social lives, the space for teenagers to articulate their honest thoughts has become smaller and smaller. They may feel trapped in societal norms that define who they are, leaving them with no outlet for their God-given creativity. 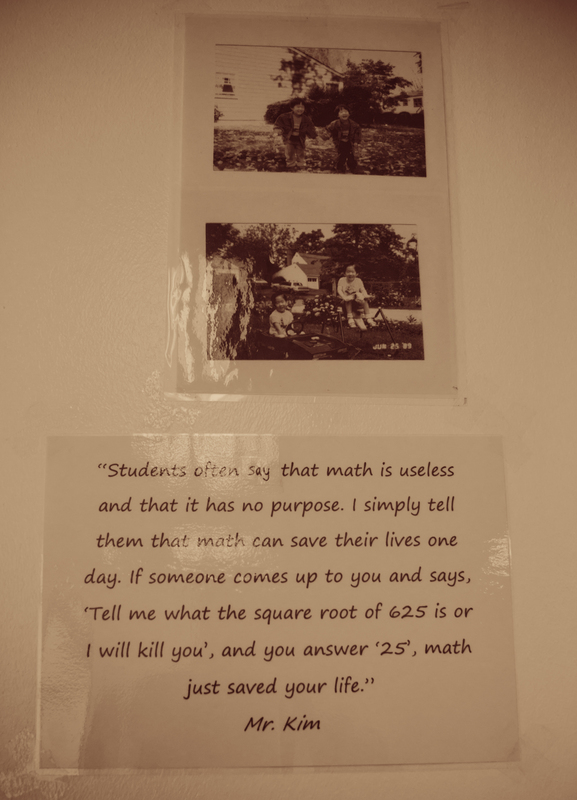 If my classroom is not a safe place for my students to express themselves, then I’m not doing my job. When I can create a classroom environment where my students feel safe enough to voice their opinions, be honest about their feelings, and have conversations with me about what they are learning (or not learning), they are more likely to engage in the material. When they are given the time and space to write down what they think about, about things they’re actually interested in, without having to perform, here’s the shocker: they can write. When they can talk about the poem they just read without having the pressure to say the right answer, guess what: they can articulate exactly why they hate that line (and then write a poem about why they hate it). And when they can see that I am not looking for mistakes but for pieces of gold in a goldmine, they are more motivated to produce their best work. In less than one year, I’ve buckled under the pressure of improving students’ writing skills. I’ve delighted over hearing some students say that they finally found writing relevant to them. I’ve cried from frustration over consistently unmotivated students. I’ve seen students beaming from their breakthroughs in their discussions of certain texts. I’ve had to apologize to students for my short temper. And through it all, I’ve discovered that I absolutely love teaching because I love seeing my students discover something new about themselves. I’ve learned that the moment I stop learning about my students and their needs is the moment I stop teaching. It’s funny: when I do that, I get to learn so much more about myself and my creative abilities to not only teach, but also to read and write. So this is my prayer as a teacher: God, give me the grace to never stop learning. I am excited to share a guest post by Chris this week, whom I first met a couple of years ago at New Philadelphia Church here in Seoul. And now we are co-workers! Chris is a passionate and well-connected educator with a blog titled Teach Science Right. I think Chris is our first high school international teacher to be featured on our blog, so check out his site, you won’t be disappointed. As a science teacher my younger students often look at me in fear at the beginning of the year. The first things they tend to notice is my buzz cut, facial hair & low voice and immediately assume that I’m an intimidating, hard-grading type of science teacher. But that doesn’t last long! I’ve learned that many students have these views of my classroom and me because often their previous teachers have filled their heads with this impression. I also know that it’s usually not me that they are intimidated by; rather it’s the content. 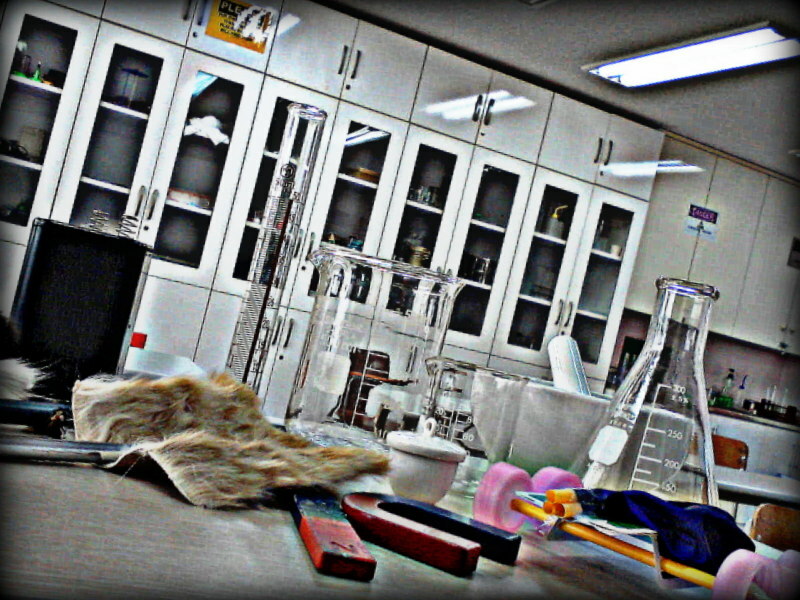 Science is given a bad rap in many classrooms (not all, but many). It’s often seen as a subject that only the socially awkward students tend to enjoy, or only the really, really intelligent kids enjoy. I’m beginning to lose count of all the parents that have personally thanked me during PTCs. Many of them express that their child grew up with a love for science, nature and experiments but quickly lost that love as they grew into adolescence and the pressures of content, tests and memorization squeezed the joy out of it for them. They express to me that their son or daughter finally enjoys science again. What music to my ears! And now I want to share my biggest teaching secret…. Now I realize many readers may teach younger students in which mistakes happen all the time and are common-place, and rightly so are seen as vital to the learning process. But somewhere between lower elementary school and middle & high school teachers have unlearned that mistakes are such a part of the learning process. Now if a student forgets their homework at home or misses a deadline… well too bad. If a student forgot to answer a question on the practice worksheet (I repeat… the practice) we take points away that can never be made up (because we are calculating their grade based on how many points they got correct out of how many points they could have gotten correct and then wonder why they always ask for extra credit). And I want to ask, where is the room for mistakes? I put a lot of effort into creating a class atmosphere that is safe – safe from ridicule of mistakes, safe from rewards for not making mistakes, and safe from a grade being lowered for making mistakes. Does everyone get an A in my class? – Nope. Not even close. Does everyone have a chance to earn an A? You betcha! To which I ask, What made you decide to teach? Did you want to prepare students for jobs? Be a tough, hard-nose teacher? Or did you simply want to inspire? Think about your hobbies – i.e. the things that you really enjoy doing and get energy from doing. Most likely they are activities in which you are no expert and you make mistakes. And most likely they are activities in which you had freedom to learn, freedom to experiment, freedom to mess-up without somebody punishing you for it. That’s all I’m doing. I’m teaching my kids to not only learn science, but to enjoy science – by taking the fear out of it. For more information, be sure to search Google for “Standards-based grading and reporting” to see where many of my methods were derived from. We are excited to start off 2013 with our guest blogger Jackie. She took the leap of faith and started teaching internationally at a school in Jakarta, Indonesia this past year. I had the privilege of meeting her in person in Singapore a few months ago when she was visiting during her vacation. She is a faithful reader of our blog and currently teaching 7th & 8th English and technology. We are thankful for her thoughtful contribution! Seventh grade students in a growing English proficiency literature class struggled to comprehend Boy Overboard by Morris Gleitzman until the setting and social issues came alive through their compositions of pecha kuchas. What is a pecha kucha and how did students compose them in our classroom? To begin, Pecha Kucha is the Japanese word for “chit chat.” The term refers to 20 slides shown for 20 seconds each. The idea originated as a way to prompt presenters to create thoughtful, compelling representations as an alternative to a popular presentation method that tempts people to be wordy, not in a good way. Our class took a cue from a previous teacher at our school, Jabiz Raisdana, to attempt amini-pecha kucha (10 slides shown for 20 seconds each) as a way to familiarize ourselves with the setting of Boy Overboard, Afghanistan. Because students appreciated the visual aspect of pecha kuchas, we decided to expand it to examine the themes of the book, Boy Overboard by Morris Gleitzman. Also, the Middle Years Program (part of the International Baccalaureate program) at our school, requires a “Visual Literacy” criterium for English Acquisition Learners which pecha kuchas provide an opportunity to demonstrate. “Pecha kuchas helped me understand the book better,” was overheard by one student in the middle of researching this project. Boy Overboard proved to be somewhat challenging with its vocabulary referencing war and its Afghan setting. When asked why and how pecha kuchas helped her, the student responded that the slides allowed her “to see” scenes from the book. Students gravitated toward the social issues surrounding the book as well. We tied the theme of gender equality, prevalent in this book set during Taliban control, to the UN Millenium Development Goals. Students followed the unfolding story of Malala Yousafzai, the Pakistani teenager who was shot by the Taliban for her BBC blog and views on education for girls–and connected this to the characters in the book as they are forced to leave Afghanistan because their parents run an illegal school for girls. We capitalized on the text-to-world connection and the visual nature of pecha kuchas to build a scaffold for students. My hope was not only that the students learn about Afghanistan and themes of the novel, but how to comprehend written and visual texts. Discussed the elements of the book: characters, setting, theme, etc. Partners chose a theme and began planning by copying and sharing this planner. Carefully evaluated and selected images that supported an understanding of the topic. Cited each image, while starting with a search of Creative Commons images. Composed text for each image that reflected an accurate reading of the image while connecting it to the topic and how it helped the students better understand the book. Recorded the pecha kucha while timing to be sure the slide was shown for roughly 20 seconds only. Screened the pecha kucha for the class, answering questions about why certain images were selected and explaining how the slideshow connected to the novel. Here is an example of a finished mini-pecha kucha on the topic of Desert Life in Afghanistan by 3 seventh grade students; Holly, Elaine and Da Ran. We are still working on beginnings, middles and endings when writing. Although the pecha kuchas encourage writers to focus on the specific image shown, we are still thinking about we can incorporate a “wrap-it-up” ending and tie the topic to the novel. Many students struggled with selecting images that “looked” like they fit the topic, but they were not sure if they were taken in Afghanistan or Pakistan or elsewhere. We discussed how Flickr images often include a description of the photo and could provide more context than a simple Google image search. Students shared the citations with me on the planner, but where should they include them on screen in the final project? Rolling credits? Mela is a veteran teacher, who has taught in Alaska, Seoul and Mali. When we worked together as the 5th grade team, I learned so much from her. She shares with us about her journey in teaching in Africa and has some great tips for the international school teacher! In 2010 I moved to Sadiola, Mali in West Africa to work at the American International School of Bamako’s satellite campus. It is a small school located at a gold mine ten hours drive from Bamako, Mali’s capital. Mali has been considered to be a fairly stable democracy unlike some of its West African neighbors. Presidential elections were scheduled for April 29th with the current president stepping down. On March 20th we heard news that soldiers had been shooting in Kati. Interesting, but not worrisome. We woke the next morning to news that the presidential palace had been stormed by renegade soldiers, they had taken control and borders were closed. We had some concern, however, life in Sadiola continued as it always had for us, unlike our colleagues in Bamako who had gone virtual and were staying indoors. We were surprised when the mine administration informed us we would be evacuated to Senegal with only ten kilos per person as soon as the borders opened. When the borders closed, supply lines were cut off, which was causing difficulties for the mine’s continued operations. As our spring break was only a few days away, we were able to continue on to the states while we waited to hear when we might return. Although we still don’t know have that answer, we have gone virtual. Virtual schooling has its own challenges, my students not having their texts (remember we all left with only 10 kilos), I have none of my teaching materials, and 10 hour time differences. However, we have high hopes for the reopening of our school. Let the lesson be, no matter how stable or safe a place may seem; the unanticipated may happen. Keep cash (local currency and US dollars/Euros) on hand; enough to buy a plane ticket to a safe place. Register with your embassy and have their numbers handy. Check if your school has an emergency evacuation plan. Think ahead, if you could only take 10 kgs with you, what would you take? Find out expectations before you go. How often are you required to post? Will the school reimburse you for pay sites? Become familiar with online resources. (Keep a list on a flash drive.) The good news is there is a lot out there. The bad news is there is a lot to troll though, and much of what is out there is not the greatest. Be flexible. Your students may not have access to a scanner or a printer. How will you handle that? Lastly, if you are evacuated, talk to your colleagues. Support each other. Julia is an experienced Kindergarten teacher who enjoys using the reading and writing workshop model in her classroom. She even had Lucy Calkins as a professor at Teacher’s College. She is a fellow New Yorker, co-worker and friend. We are excited for her next journey! 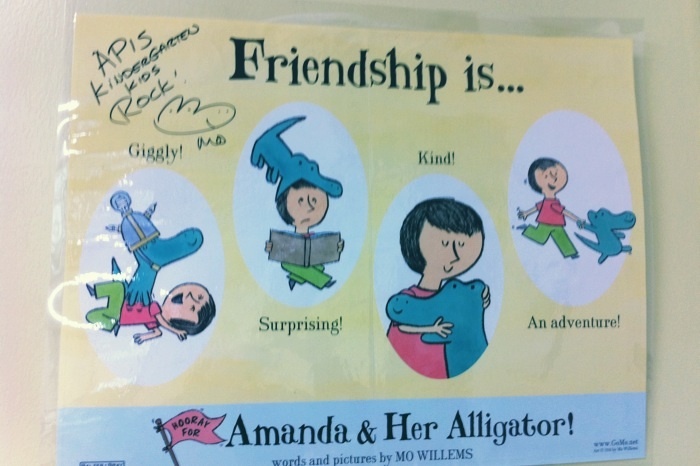 My last year’s Kindergarten class loved Mo Willems. We read every single Mo Willems’ book available at the school library and I purchased titles unavailable at school. Naturally, Mr. Willems was chosen for our Aurthor Study unit. During Reading Workshop, we discussed Mo Willems’ writing and illustration style. During Writing Workshop, we tried one or two of his styles in our own writing. Towards the end of the unit, children wanted to meet Mo Willems. They wanted to know if he could come to Korea or if we could take a class trip to his office. I brought it to my classroom, shut the door, and opened the envelope like a little kid opening a Christmas present. 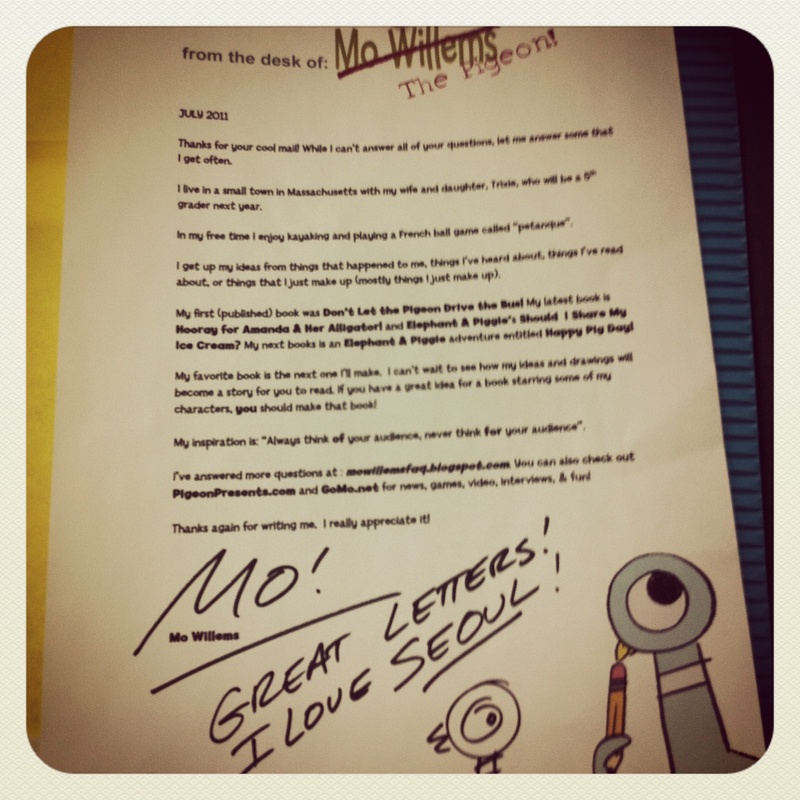 Mo Willems wrote back to us and sent us an autographed book poster! Mo Willems ROCKS! *I highly encourage you to allow each child to send their own letter at the post office. (Rather than sending it in one large envelope.) They loved it. For most of them, it was their first time mailing something, let alone their first time at the post office.